Much like my ending with Black Widow, I’ve really been putting off picking up Carol Corps. I really loved Captain Marvel, and I feel like nothing can replace the void that has been left by both her book and Widow’s. But when I picked up Carol Corps issue 1 yesterday, I was very into it. It may be because Kelly Sue Deconnick still has her hand in it, but whatever it takes to get me into it, I’m alright with. This issue introduces us to Doom’s Battleworld. As a result of the multiverse being destroyed, two earths merged into one; lead by Victor Von Doom. I did not keep up with the event that merged earths, so all of this was an introduction to me, and I’m quite alright with that. 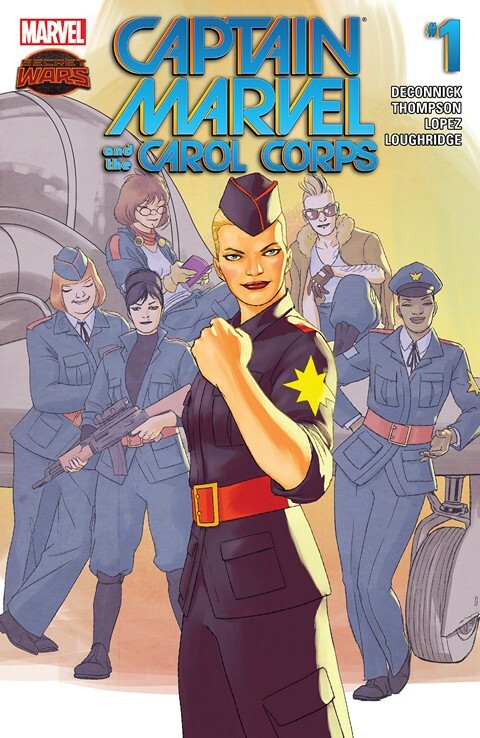 Captain Marvel leads a squad of fighter pilots; the Carol Corps. They are led by another, and everyone is led by Doom. It’s an interesting hierarchy, seeing Captain Marvel as a gift from Doom to help the fighter pilots is very bizarre to me. While out training one day, the Carol Corps see that Hydra has come into their territory (in this earth, Hydra has their own area that they should be staying in), and as the Carol Corps go to take care of it, the Thor Corps bursts in, clearing the area. 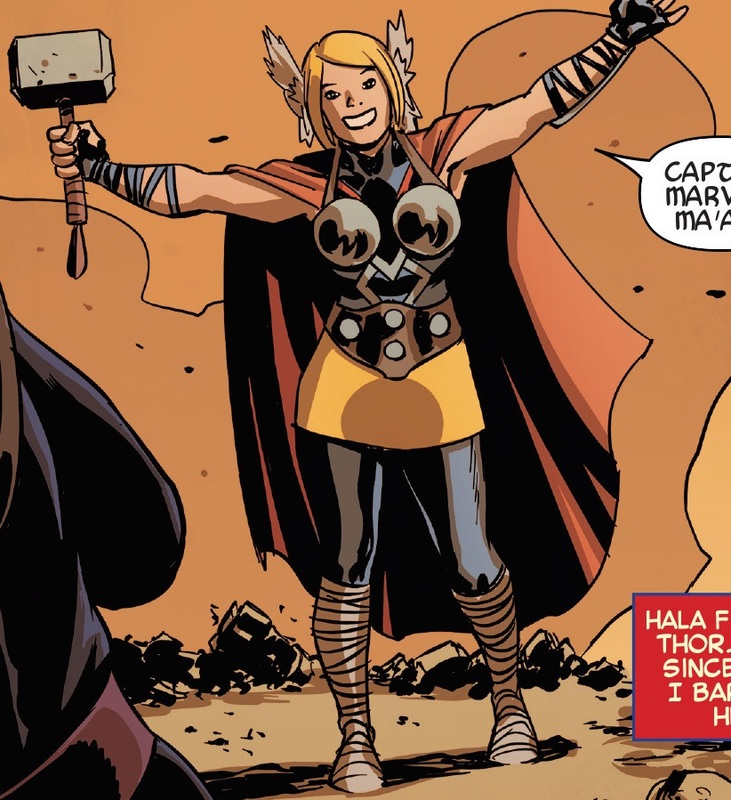 As the ladies head out, Captain Marvel is stopped by Kit, now a Thor. For those who followed Captain Marvel’s most recent solo book, Kit is also known as LT Trouble, and is the daughter of one of Carol’s friends. They talk, briefly, and Kit mentions that Doom forged her hammer from a star in the sky, even though everyone has been taught that after the sky is just the void, and it is all controlled by Doom. This starts Carol on questioning some stuff, even her orders from her superior! She is to take the Corps out to take down a gang of rogue Ultrons, but Carol doesn’t want to. When they get to the area, they see that the Ultrons aren’t flying, but using a boat. Upon further inspection, Captain Marvel realizes that they aren’t Ultrons at all, they’re humans. 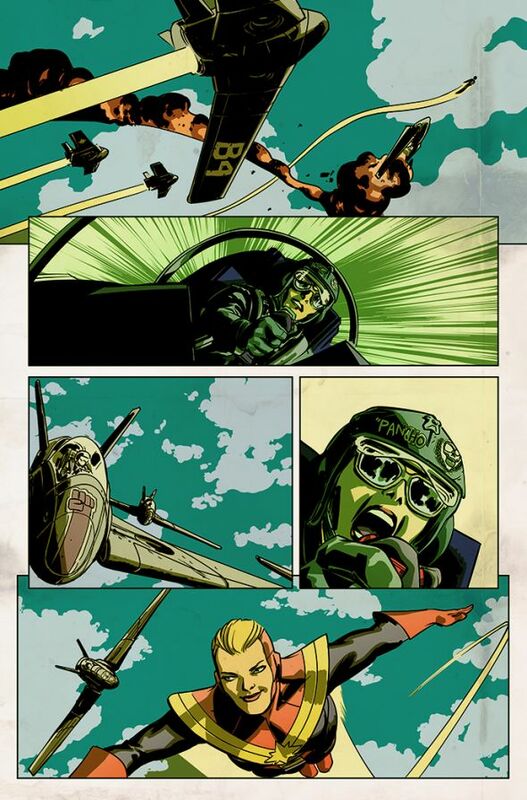 Her Carol Corps shoot their weapons to follow orders, but Cap dives in and (barely) saves one man. She’s seen bringing him in to her bunker (where the rest of the Corps has been worrying about her) and the issue ends with them all worrying about this stranger. I found this to be a very strong first issue; it had action and excitement, but left enough space for me to want to come back. It was definitely interesting, and I recommend you Fangirls start picking it up.